Learn how to rack up miles and rewards points and stop paying for flights. Do you want to travel More this Summer, but don’t want to drop mega $$$ on flights and hotels? The average cost for a family summer vacation is $4,000 - It really pays to get airline flights and hotel stays covered for free. Using miles and reward points can cut the cost of summer family vacations in half. Below are some strategies and online resources that show consumers how to rack up miles and rewards points so they can stop paying high prices in cash for their flights. If that touches a nerve -- then it’s time to start earning miles and points and start traveling more often, cheaper and in style. NoobTraveler is a website dedicated to educating its readers on reward travel, travel tips, and cost-saving travel techniques. The editorial particularly focuses on new travelers (or as they like to call them, "Noobs"), and it teaches its readers how to save big when traveling. Noobtraveler informs its readers that the quickest way to start earning miles is by signing up for rewards credit cards. The banks backing rewards cards today are giving away huge sign-up bonuses for applying for their cards. These miles and points bonuses are large enough to redeem up to four round-trip tickets overseas a year. That’s some instant value. Below are 5 actionable strategies that help individuals save when traveling this summer. People work hard for their money, and they want to stretch their dollars. A personal motto should be: Every dollar spent that doesn’t earn a mile/point is a missed opportunity. Individuals should use their rewards card(s) for their everyday purchases and bills to maximize their dollar. There are many spend bonus categories within rewards credit cards that earn between 2-5 reward points per $1 spent. Extra miles and points can be earned for buying gas, groceries, and paying bills. Chase Ultimate Rewards Program has lots of extra add-ons for miles and points. Don't miss out on using your hotel rewards membership number when you stay at hotels. It’s free to sign up for airline and hotel rewards programs, and it is easy to sign up on their websites. Once signed up, individuals can fill in their membership number during the booking process to receive miles/points, and often times other benefits. Companies are always running promotions or having sales to increase business. The same goes when it comes to miles and points. For example, last month there was an offer for 25,000 American Airlines miles for users who signed up for DirecTv. Considering the value, this equals your first year of DirectTv for free. This is just one example of many great bonuses out there for services that individuals may already be using. Also, traveling during non-peak season can save thousands of dollars. It takes a little organization and planning ahead, but the savings are well worth it. It can be a challenge to travel off peak during the summer months, but traveling towards the end of the summer and in particular traveling to South America, offers off-peak pricing. The best time to travel for non-peak miles and points pricing is in August or early September just before school starts back again. The difference in prices and reward rates a week before or after a non-peak season can often be double. Priceline offers consumers a way to get a hotel at a very competitive rates. The site lets you bid for hotels after picking your chosen location and star rating. Great, right? But how do you know the magic number to bid? Don’t worry, there is a great website called betterbidding.com. It lists the latest bids so consumers don't overbid for a hotel. 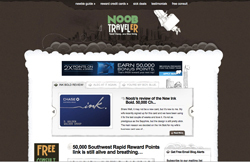 NoobTraveler.com is a blog dedicated to educating its readers on the best airline credit cards, reward travel, travel tips, and cost-saving travel techniques. The blog particularly focuses on new travelers (or as they like to call them, “Noobs”), and it teaches its readers how to save BIG. All the while, the site maintains a humorous writing style that is both fun and informative. Noob Traveler also curates the best rewards travel deals in his daily blog posts and articles.